The colors of the Hong Kong flag are red and white which are the same as the Chinese flag. The flower has 5 pedals and each petal bears a five-pointed red star which are similar to the 5 stars on the Peoples Republic of China (PRC) national flag. It does represent the political idea and principal, "One Country, Two Systems" for 50 years which is stated in the Basic Law. The flower is actually Bauhinia blakeana. There are many of these flowers in Hong Kong, especially in the Government House, the former official residence of the Hong Kong Governor. When I was a kid, the former Governor House was open to the public annually around April for appreciating these flowers. They come in many different colors. My parents took us there one year. 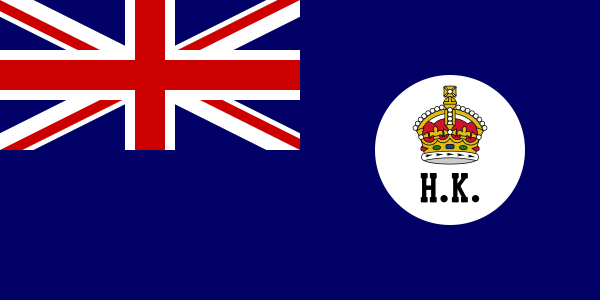 Before the Handover 1997, Hong Kong had another flag as a British colony. It changed throughout the colonial era. Totally, there were 4 of them. There was one thing never changed. It was the British flag which was always on the top left corner of the flag. In the middle of the right half of the flag, there was always a circle with the theme of Hong Kong. You could tell the design reflect the idea of "Hong Kong under British rule". Compared 2 flags, the current one only blend in the design of the China flag. The old flag design symbolized the British colonial rule. The HK flag must be flown together with the PRC national flag. And it must be flown lower than the national flag and it must be smaller in size. It represents that Hong Kong is under the Chinese rule, not the British colonial rule anymore.